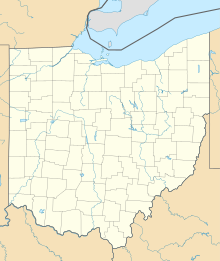 Lebanon-Warren County Airport (FAA LID: I68) is a public airport located three miles (5 km) northwest of the central business district of Lebanon, on Greentree Road, in Warren County, Ohio, United States. It is a county-owned public airport operated by the Warren County Airport Authority, a board of 9 members appointed by the County Commissioners. The runway, taxiway, and communication and navigation aids are County owned. The Airport Authority leases a terminal for public use on adjacent private property. The hangars, and other airport buildings are privately owned and operated. Daily airport management is handled under contract by fixed-base operator (FBO), Warren County Airport, Ltd. There is one North-South Runway (01/19). The runway is 4502' x 65' asphalt paved with lighting for night operation. The runway has displaced thresholds on both ends to clear obstructions. Airport elevation is 898'. There is a taxiway parallel to the runway. For the 12-month period ending December 19, 2006, the airport had 24,951 aircraft operations, an average of 68 per day: 99% general aviation, 1% air taxi and <1% military. There are 104 aircraft based at this airport: 72% single-engine, 26% multi-engine (27) and 2% jet. This page was last edited on 5 October 2018, at 13:35 (UTC).